This year, I had so many ideas of quilling tutorials to write for the holiday season! After spending some quality time with my calendar and realizing exactly how little time I had left before Christmas, I had to narrow that list down quite a bit. But the one idea that I couldn’t let go of was making some quilling paper poinsettia flowers. So I decided to jazz them up by making the poinsettia with one of my favorite tools, the quilling comb! I used my workboard, a needle tool, some white glue in a needle-nose squeeze bottle, and the quilling paper of your choice. This deep crimson is my go-to red, and I also used some pale yellow. The only other tool you will need is a quilling comb. Also sometimes called an onion holder, a quilling comb has a plastic handle with many metal pins pointing out. It is used to make multiple loops from a single quilling strip at a time. In a pinch, you can use a regular hair comb or a plastic hair pick. But I’ve found a real quilling comb had smaller teeth and is easier to get the paper to do what you’re looking for. The first step to making a quilling paper poinsettia flower is to roll one end of a strip of quilling paper on your needle tool a couple times. Don’t worry about how long of a strip to use at this point. I would use an entire strip to start with, as its easier to manage longer strips on the comb. Gently slip the coil off your needle tool, and place it on one of the middle pins of your comb. This gives your strip a nice place to start on your comb, but I like to hold it still with a finger to make sure it doesn’t unravel as I move the rest of the strip around the pins. Make sure the tail of your strip is towards the back of the comb. Pull it through to the front right after the next pin. Now, this is where it might get tricky, so just bear with me. The main idea is to loop the tail of the strip around the pins of your comb, moving one pin out from the center on each side as you go. So, after bringing your strip back up to the front in the last step, pull it around one pin from the center on the other side and to the back again. Next, continue by bringing the strip back to the front, but around one pin further out from the center. Making another loop, bring it to the back around one more pin on the other side. Bring the strip back to the front and make one last loop in the same way. At this point, the quilling paper strip should be looped around 3 pins on either side of the center loop that you started with. I know this sounds complicated, but follow the photos and you’ll get the hang of it quickly! When you’ve finished your loops, tear off the rest of your strip leaving just enough to glue on the outside. This will be enough to keep your loops together! Repeat these steps 2 more times. These 3 are going to be one petal of your flower. To form the petal, apply a very thin line of glue to the long edge of comb loops and stack them together. Hold all three between your hands and pinch both ends to a point. I think it’s a good idea to wrap each petal in a matching strip of paper to make the edges look more finished. Each flower uses two layers of petals. The larger petals are made in the same exact way as the ones above, but instead of looping around 3 pins on either side of the center loop, you’ll want to loop around 4. When all your petals are formed, glue the 5 small ones together and the 5 larger ones, as well. While they dry, roll 7 tight coils from 1″ strips of pale yellow paper. With a small dot of glue, place the small petals on top of the larger petals. Be sure to stagger them so they’re not all pointing in the same direction. Add the yellow coils to the center. There are a few other common shades of poinsettia flowers, like pale pink and white. There’s even some lovely pastel green varieties! 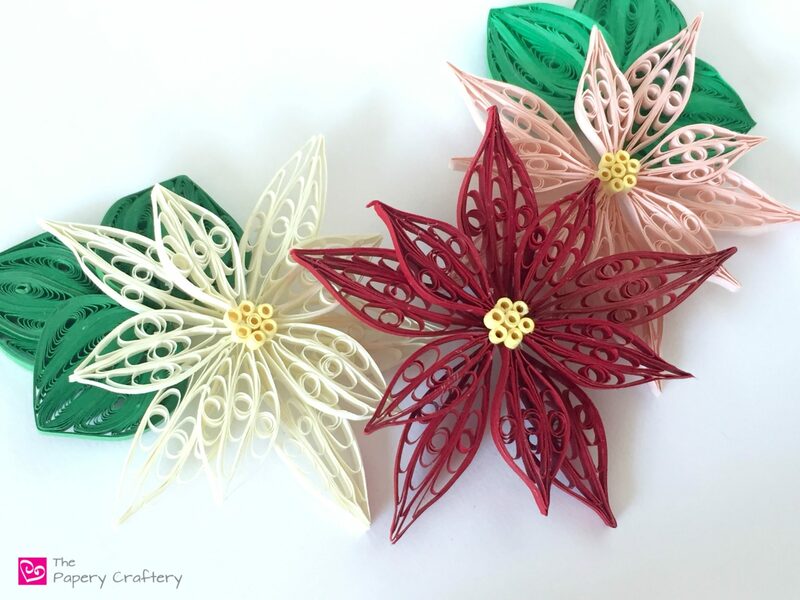 These quilling paper poinsettia flowers would work great on holiday cards. Or maybe scattered along a table for a touch of color! For instructions on making the leaves I used in these photos, check out this post on quilling greenery. But I think the best part is that they can be used after the holidays too! These big blooms are perfect for brightening up a space during the gloomy winter months! Go ahead and grab a quilling comb. I promise you’ll really enjoy the lacy texture of these flowers! That’s wonderful! Please check back in and let me know how it goes!